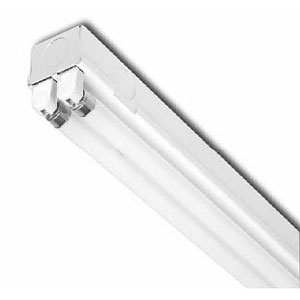 The ST2 is available in nominal 2’, 3’ and 4’ lengths in 1 or 2-lamp configurations, T5 or T5-HO. Fully-assembled housing designed for individual or continuous row mounting. Predrilled mounting holes for easy installation. Can be fed through end or back of unit. Suitable for low density ceiling applications. 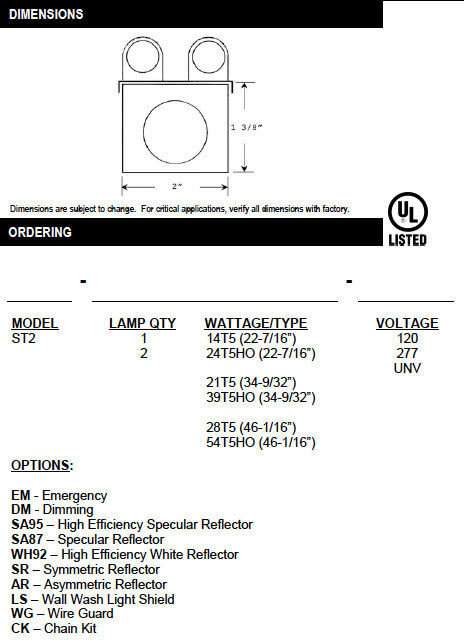 Symmetric, asymmetric, and light shield and swivel adjustable reflectors available. Available with specular aluminum reflector (87% reflectance), high-efficiency white reflector (92% reflectance), or high efficiency specular aluminum reflector (95% reflectance). Die-formed, heavy gauge steel housing with ample knockouts for ease of installation. All parts pre-painted with high gloss, baked white enamel with minimum 89% reflectance, applied over iron phosphate pretreatment for maximum adhesion and rust resistance.